project 947Construction of 5 Eco San Toilets in Paringwa Village of Shohratgarh Block. The Progarmme aims to construct 10 Eco San Toilets in Village Paringwa of Shohratgarh Block Of district Siddharthnagar. As per my earlier mail, program is not implemented in the village as community is ready for construction. It is found that village is Brahmin prominent & they believe excreta re-use in not good as per their purity & pollution theory. Later Construction of 5 ECO san TOILET is Shifted to Agaya Village. As per earlier notes, community is not ready for construction. so, construction of 5 eco san is hifted to agaya village. As mentioned in last note that some people has protested against construction of eco san toilets. the reason is that they are not ready to use excreta as fertilizers. Today meeting was scheduled but community members did not appear. When we tried to contact that they are not even ready to come in meeting . I have again contacted Gram Pradhan Yadav Ji. His Behaviour is too changed this time. He said collection of excreta as fertilizer is not acceptable to villager & we do not allow construction of such toilets in our village. Meeting was conducted at house of gram pradhan Jagdambika Yadav. 19 community member has participated. Few new community members participated & protested about community taking out excreta from eco san toilets. they have tried to influence other community members over the issue. We tried to let them understand about process clearly. Yet , they were not agree. Gram Pradhan told us he will try to pacify them over the issue & discuss it again in next meeting. Meeting was organised at Channana Devi's plac- SHGs member. total 22 people were participated in meeting. They were told about material to be used in the construction of ecosan toilets. Community talked about size of toilets.but not reached at what should be size of toilet?? Some has shown interest " how fertilizer can be used ." Project staff told about nutrients which can be used as fertilizers. The community is looking eco san pan as better option than cemented one..
Meeting was organised with community . 21 people from community participate in the meeting held at Dukhna Devi'splace.Dukhna devi is member of Self Help Group created by SES. Most of participants were women.Benefit of eco san toilet over traditional toilets were discussed. Community was curious about material use in toilets & how structure is raised. It is told them through chart & pictures.3 women were eager to construct toilets but they told that they will tell their decision after discussing with their family. 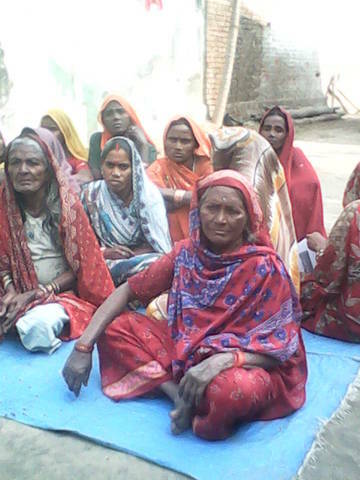 In last Month 15 meeting were organized in two villages. They were again & again told about benefit of ECOSAN. They were also told about relation between Health & Sanitation. Still people are hitch about ecosan toilets but some people are ready to construct eco san toilets. Till date 3 family has been identified for toilet construction in these two villages. Community worker has visited Agaya Village, which is one of two targeted village.He gathered community at once place. Around 30 people from community were presented in meeting.They were told about Sanitation & SECOSAN model. Community worker also told about relation of excreta to groundwater contamination & consequently affecting health. Some people presented were enthusiasm over fertilizer usage. But Some have told that traditionally purity & pollution concept is prominent in our village from ages. We would like to discuss it in our family. Some has said the awareness on sanitation has increased over last few years & would like to understand model thoroughly with you (Community Worker). Community worker feel that duration of sensitization should be long so behavior of community can change over sanitation.